FREE! 10/30 – 10/31. A thriller, a peek into the future and a love story! 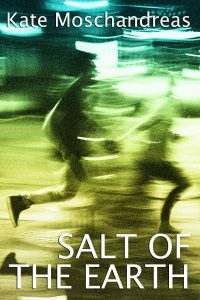 Kirkus calls SALT OF THE EARTH "Blazingly paced, exciting, and satisfying—an excellent futuristic tale." It’s 2038, and Berkeley, CA is drought-ravaged, dusty and smog-filled. Jess Prentiss, a chemistry student, starts her day with a jog through the hills – only to realize that she is being chased. Over the course of three days, she barely stops running. Fleeing from one narrow escape to another, Jess learns that it's her own scientific discoveries that are at the crux of a massive power struggle involving water, salt, cut-throat capitalistic contracts, worldwide famine, the Governor of California and a radicalized populist environmental group. With time ticking, Jess must discover which players are the good guys — and whether 29-year old Matteo Wu, the man who appears out of nowhere to help her, is someone she can trust with her life and heart.